University of Utah computer science graduate students are working with other institutions to develop software that combines computer images and data to create stunning imagery of the universe and solar system. 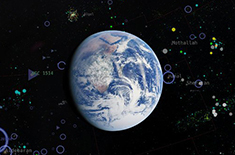 OpenSpace is open source interactive data visualization software funded in part by NASA is designed to visualize the entire known universe and portray ongoing efforts to investigate the cosmos. The software can be run all displays, even touch tables and kiosks allowing planetariums and science museums around the world to give visitors the chance to fly through the universe.